PGS launched the ‘ghost-free’ GeoStreamer GeoSource solution in 2011: a time- and depth-distributed source using sub-sources operated at specific depths and time delays, attacking the source-ghost effect in seismic data. A New Wave of Exploration Offshore Croatia. Proven hydrocarbon systems, shallow waters and proximity to hungry energy markets: is it time for Croatia to emerge from the shadows of its neighbour on the other side of the Adriatic Sea? Sub-Salt Plays of the Ultra-Deep Water. Despite the accepted need to reduce greenhouse gas emissions, oil production is set to increase for the next 30 years, according to the US EIA . Licence Opportunities That Could Shape 2014. An oil boom city, Aberdeen’s growth since the 1970s into one of the main global hubs of the oil industry has shaped and defined the modern city. Author Clare Dudman uses diaries, letters and published papers to create a novel that takes the reader into the thoughts and life of the revolutionary German scientist, Alfred Wegener. Amongst the great challenges facing E&P professionals today is how to pool their collective experiences and talents in order to filter the feast of opportunities, from exploration acreage to prospect, field development and acquisition opportunities. This article suggests how the use of analogue data can help to reduce the risks and increase the chance of success. With most of the ‘easy’ oil discovered, where are companies looking to find oil and gas reserves in the mature UK continental shelf? Just How Good Are We at the Digital Oilfield? Dr Julian Pickering, Digital Oilfield Solutions Ltd. and Samit Sengupta, Geologix Ltd.
We live in an age where phrases like ‘Integrated Operations’ and ‘Digital Oilfield’ have become part of our everyday parlance. But what do they really mean? If Iran Strikes a Deal…? Petroleum Geoscience has been taught at Imperial College in London for 100 years. Professor Richard Selley, who has spent much of his career at IC, tells us about the course and the centenary celebrations. 4D gravity data is a very useful additional and independent source of information for monitoring reservoirs. A. Edwards, J. Heller, S. Clancy, N. Whitfield, and S. O’Connor, Ikon Science. 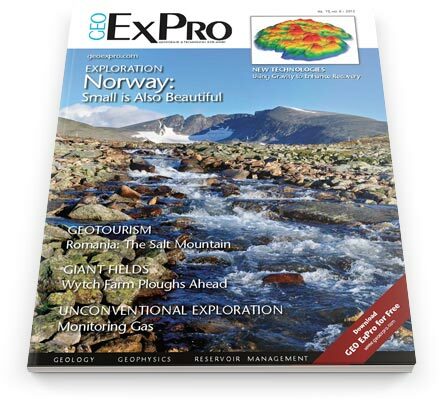 Predicting pressure in basins that are exhumed or contain rich source rocks is difficult. We look at a case study from the Barents Sea region. In the face of widespread fears in the public about potential pollution as a result of fracking, we take a look at standards and best practices for environmental monitoring of onshore hydrocarbon exploration and development.